A perfect commemoration for the deceased during All Souls' Day Services on November 2 or throughout the year. An area on the candle provides for the inscription of the deceased Parish members' names. 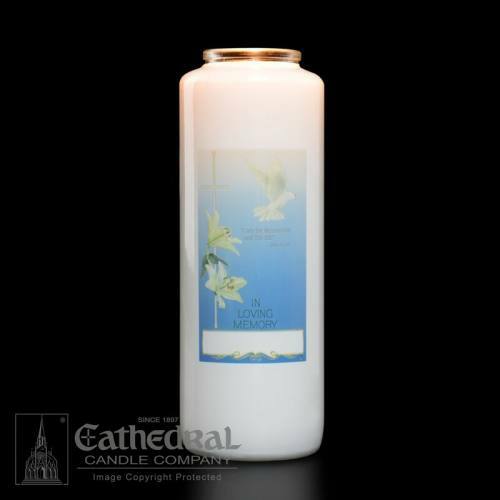 Cathedral Candle has served Christian churches through the master craft art of candle making for more than a century. Today, they still hold true to the innovative methods, and the finest formulations used since their original Syracuse factory began production in 1897. Cathedral Candle has worked hard to perfect the hand work and ornamentation techniques their founder and great-grandfather Jacob Steigerwald created. And they are proud to continue supplying a top-quality product that preserves his tradition of helping churches to light religious faith with the living flame.